Livewell Chiropractic CenterNewsSportingDoes Rain Make You More Prone to Injury When Playing Sports? When it rains it pours, especially when it comes to being an athlete and getting injured. One of the most common sports-related injuries is caused by simply slipping in the rain, especially in soccer. Some sports like baseball decide to take a rain check in mild weather conditions, but for other sports such as football, cheerleading and track and field, the show must go on in almost all weather conditions. While you can’t control the weather, you can be mindful of slipping, stretching and shoe selection in order to prevent the nasty weather from raining on your parade. Here’s how. In many sports, sliding in to score a run or goal is a good thing, but slipping is a totally different ballgame. Unintentional slips in the rain can cause long-term injuries that require medical attention. It’s easy to get carried away when there’s time on the clock, but make sure you pay close attention to your surroundings when it’s raining. It’s a win, win situation in staying safe. As with any athletic activity, stretching before hitting the ground running greatly reduces injuries, especially when it’s slippery outside. Stretching causes your muscles to become more resilient and bounce back quickly even if you do take a fall. Be sure to spend at least 10 minutes warming up before training or participating in athletic activities to prepare your body for upcoming movement and possible wet conditions. Deciding what kind of shoe to wear is also directly related to sports performance and injury prevention. Buying a pair of shoes that are slip resistant can keep you on your toes in wet weather conditions. Examining the shape and size of your shoes can determine if they are the right pair for rainy days. Sports shoes with flat edges on the outsoles and rigidly shaped cleats can cause the water to gather at the bottom of the shoe instead of pushing it away. It’s better to go with shoes that do not have flat edges on the outsole to create better traction against water. If you’ve taken a fall and want to get an evaluation or treatment, schedule an appointment with us. Dr. Kim specializes in providing treatment of a variety of rain-related sports injuries such as hip, knee and shoulder pain. 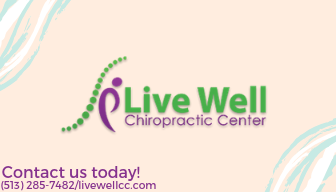 Get in touch with us by emailing info@livewellcc.com or calling at 513-285-7682. Also, feel free to send us a message for general questions or inquiries. Be sure to check us out on Facebook, Twitter, and LinkedIn for our latest updates!